This page is fired off by the basic instinct page, in which the statement Answer the hane with an extension was criticized. 1. Answering the hane with an extension? When seeking sabaki one rather counter hanes or cross-cuts. Of course, the surrounding conditions make a big difference, but in general I think that the extension is not so good. It gives the opponent the opportunity to make good shape. But perhaps the counter-hane should be the first thing to think about. The most tempting response is to play atari-atari, but then Black has to protect his weakness with Black 5. 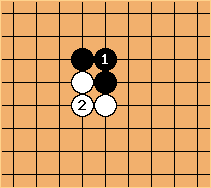 Now White 6 captures the black stone in geta. KarlKnechtel: How about this atari-atari? 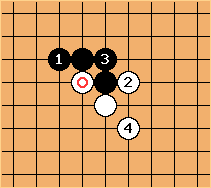 If Black is protected on either side (e.g. by a stone at any of the marked points, or some other ladder breaker) then there is time to protect on the other, and it's like one giant crosscut. Otherwise probably not good for Black overall, though. 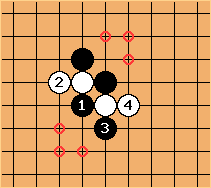 Black 1 can play atari with sente, but then Black has two cutting points at a and b to worry about. If Black protects, White can do the same. 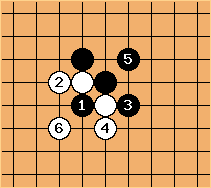 If Black extends, White can play kikashi with White 2 - Black 3, and then protect with the hanging connection of White 4. White treats the marked stone lightly. When the marked stone is present, the nobi is a good response. 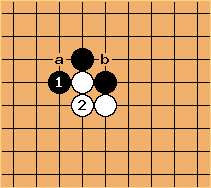 One of the reasons is that if Black plays at a, he reduces his own liberties. Statement by DieterVerhofstadt (admitting he is wrong); criticism by BillSpight.